"The village used to be spoken of as a “township by the cliff,” on which, in Saxon times, stood a fort, where an extensive view could be obtained of the surrounding country; for in those times the passages of the river were jealously guarded. "The headquarters of Leofric, an Earl of Mercia, were at Newark . He had a residence at Fledborough, and was frequently visited there by his Countess Godiva, who is supposed to have erected the first place of worship in that parish. "The “Fort on the Cliff” would, consequently, be of some local importance. The Trent, at one time, undoubtedly covered a considerable part of South Clifton . The ferry at South Clifton has been used from time immemorial, most likely during the whole of the Saxon period; and it was across there that Edward I. and Queen Eleanor came in November, 1290, from Marnham to Harby. King John, Henry III, and the first three Edwards, frequently visited these parts, and Edward I founded a college for secular priests at North Clifton . "The parish at one time included Spalford and Harby. 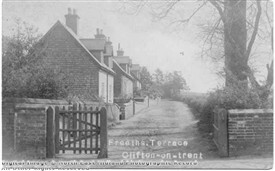 In old times the priest of Clifton had a prebendal stall in Lincoln Cathedral, and the prebendal residence was at North Clifton, on the site of a farm house now occupied by Mr. Abraham, a respected farmer in that township. The villagers of this place (North Clifton) used to be free of the ferry, and the ferryman and his dog used to claim a dinner every Christmas Day at the Vicarage, the ferryman also received from the inhabitants a loaf of bread. "The Bishops of Lincoln used to be lords of the Manor of North and South Clifton . In the eleventh century there were 1,300 acres of land under cultivation, and 90 acres of grass land. The names of some of the early proprietors, and a few particulars respecting them, may be interesting. In the 12th century the rich Sir Roger de Busli, who owned Spalford, had a Manor here. 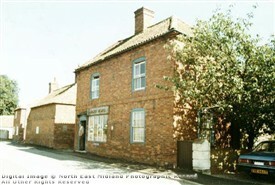 In the 13th century it passed into the hands of the Lovetots; in the latter part of the 14th century Richard de Willoughby was the principal owner, and afterwards a family by the name of Howell. It seems not to have remained in their hands a long time, for we soon read of a family of the name of Northwell as owning much of the lands in both Cliftons. "In the 15th century John Tuke, a considerable landed proprietor, became the largest owner. It appears that Sir Henry Sutton, a well-known name in this part of the county, received the Manor of South Clifton from Lord Eresby in the beginning of the 15th century. In the 16th century the chief owners were Sir Richard Basset, of Fledborough, and Wm. Dymoke, of Leicester . "The late Geo. Freeth, Esq., became eventually the chief owner, and expended a considerable sum of money in the improvement of the estate. He also built the Hall, and laid out the grounds surrounding it, at North Clifton ; and his sisters, the Misses Freeth, of Standard Hill, Nottingham , have lately come into possession of nearly all the land in both townships. "A great drawback to the land near the river bank is its liability to be flooded after every heavy rain. A hundred years ago Clifton was a busy flourishing place, partly owing to the river traffic, which was then considerable. As to the fort that at one time overtopped the cliff, the writer has satisfied himself as to its site and river side approaches. "After Henry VIII’s time the Vicarage was erected at South Clifton , now called the Old Vicarage, and occupied by Mr. James Baines. The Hall, occupied by Mrs. Freeth, widow of the late George Freeth, Esq., though not large, is pleasantly situated. "The church belongs to the 13th century, but contains also traces of Transition Norman, Pointed Gothic, and Early English styles, and has five stained glass windows. The tower, a noble, square and massive erection, in a good state of preservation, is at the west end; the tower arch is an exceedingly good specimen of Early English, with a castellated moulding, which adorns its capitals. On the under surface of the arch there are escutcheons, which bear respectively a cross, three crescents, a bend, and a chevron, being the arms of some of its early and principal proprietors. The chevron belongs to the Chaworth family, and the cross to the Howells. South Clifton contains a commodious, modern, and ornamental chapel, which is well supported. The river bank affords a delightful promenade during the summer months".